Dioceses, parishes and Catholic nonprofits must comply with the Church’s own canon law as well as applicable local, state, and federal laws. The Standards for Excellence build upon that foundation, and go a step further. Based on fundamental values - such as honesty, integrity, fairness, respect, trust, compassion, responsibility, and accountability - the Standards for Excellence describe how Catholic dioceses, parishes and nonprofits should act to be ethical and accountable in their program operations, governance, human resources, financial management and fundraising. They respond to the call to good stewardship and accountability in the U.S. bishops’ pastoral letter, Stewardship: A Disciple’s Response. The Standards for Excellence are intended to describe how the most well managed and responsibly governed dioceses, parishes and Catholic nonprofits operate. They provide benchmarks related to temporal affairs to determine how well a diocese, parish or Catholic nonprofit is fulfilling its obligations to those who benefit from its ministry programs, to contributors, and to the public both inside and outside the Church. Eight (8) Guiding Principles are provided, along with fifty-five (55) standards - more detailed performance benchmarks that will enable Catholic parishes, dioceses and nonprofits to strengthen their operations. 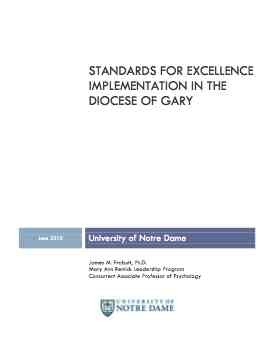 Standards for Excellence in the Diocese of Gary, IN.